Demonstrate your strategic international HR leadership with the Senior Professional in Human Resources – International™ (SPHRi™) from HR Certification Institute (HRCI). 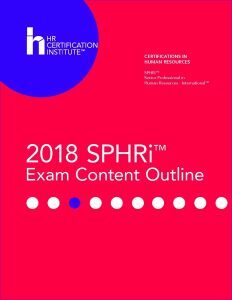 The SPHRi (formerly the Human Resources Management Professional™ or HRMP™), for internationally based HR leaders, validates senior-level HR competency and mastery of generally accepted HR principles in strategy, policy development and service delivery in a single international setting. Independent of geographical region, the credential complements local HR practices. organizational environment that encourages and retains the employees. performance. Interpreting data to improve employee performance and increase the value of the organization. Looking for a quality and affordable training for your next certification?